When it comes to the ‘wall,’ the Nation is divided. If you’re driving the 70 miles from Tucson to Sells, Arizona, you might want to stop for a break at the Sells grocery store. It looks a lot like any other small-town American market. But the sign above the pizzas reads S-gewi haiku huk, not “frozen foods,” because this small town is the center of business and government for the Tohono O’odham Nation, and the signs are in O’odham Neogi, a language you’ve probably never heard of. Keep heading south along the two-lane highway, and you’ll see a stunning desert landscape with a jagged mountain backdrop. In just 20 miles, though, you’ll have to stop again. Not for a break, but because the road ends here, at a big empty lot near a fence. Border Patrol agents are parked here, and you are not allowed to cross the border into Mexico. Lately, the only entities allowed to cross freely are dogs. They don’t appear to have owners, but they don’t look too hungry: The Mexican ranchers south of the fence, the Tohono O’odham, who are American citizens, in the north, and the Border Patrol agents in between them somehow manage to keep the dogs fed. For the dogs, life on the border is simple. For everyone else, it’s complicated. Before Mexico, before the United States, before the Tohono O’odham were a federally recognized tribe, and long before the era of modern border security, the Tohono O’odham — desert people, they call themselves — lived in what is now southern Arizona and northern Sonora, Mexico. For thousands of years there was no border, and even after its creation, it had little impact on the tribe. But today, the tribe is divided. A security fence separates their ancestral lands and citizens, and the Border Patrol monitors their territory so closely that tribal members cannot cross freely to conduct business, attend religious or spiritual gatherings, or visit family and friends. Today, the tribal government spends $3 million annually on border security, and the tribal police force spends half its time on border-related issues, including illegal drugs and immigrants. Border freedom is a privilege reserved only for dogs. 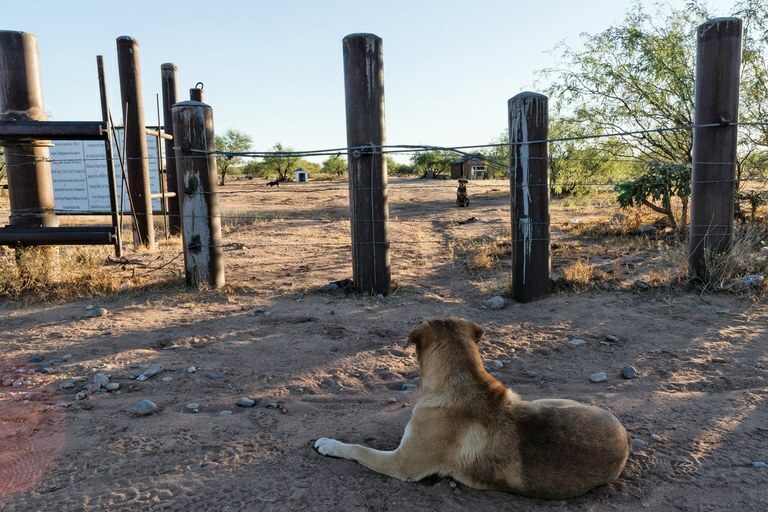 Dogs gaze across the fence that runs along the border between the Tohono O’odham Nation in the United Sates and a ranch in Mexico. A sign nearby — in English, Spanish and the Tohono O’odham language — informs people they must be inspected before they cross. During President Donald Trump’s campaign, when “the wall” was arguably his hottest issue, a brief media storm passed over the reservation. Reporters parachuted in and painted a simple picture, saying the tribe was opposed to the border wall and, therefore, largely against border security. The first part is true; the latter, less so. Popular opinion and the tribal government are nearly unified in their anti-wall stance: “Over my dead body we will build a wall,” the Tohono O’odham Vice Chairman Verlon Jose famously said. But the wall is only a small piece of the border puzzle. When it comes to O’odham approaches to border security, the opinions of people are as diverse as the desert is dry. The older generation is reflective of many American baby boomers: more conservative, more willing to cooperate with the federal government, and with a track record of supporting and enhancing border security in their roles as government officials, law enforcement and community leaders. They want to protect their tribe’s youth — and by extension, the United States — from the dangers of illegal immigration and drug cartels. For years, the tribal government has actively cooperated with all relevant agencies to police illegal border activity, particularly since 9/11, when the federal government and the tribe built a vehicle barrier along the border. But there is also the younger, activist generation: idealistic and educated about international Indigenous issues, eager to put tribal sovereignty above the needs of the federal government. 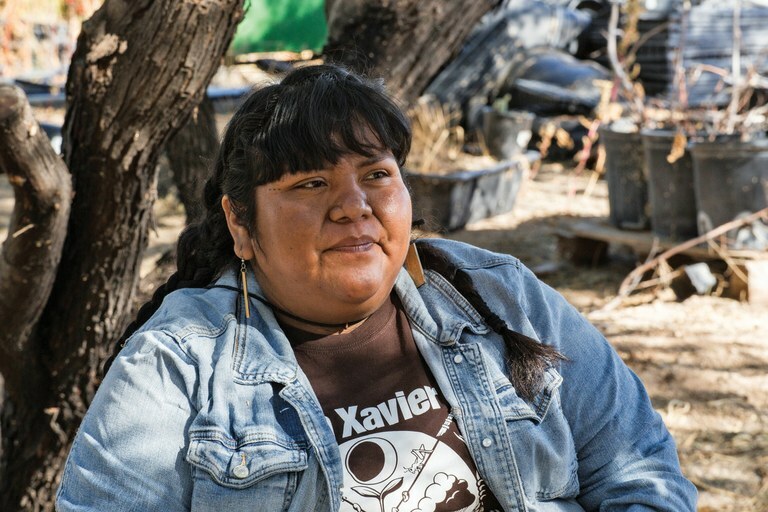 They believe in “decolonizing,” and they are aggressively opposed to the militarization of their reservation. They value Indigenous nationhood over allegiance to America. Some critics dismiss them as conspiracy theorists. And then, there are those in between, like Art Wilson, Tohono O’odham legislative councilman. “It’s complicated,” he said. 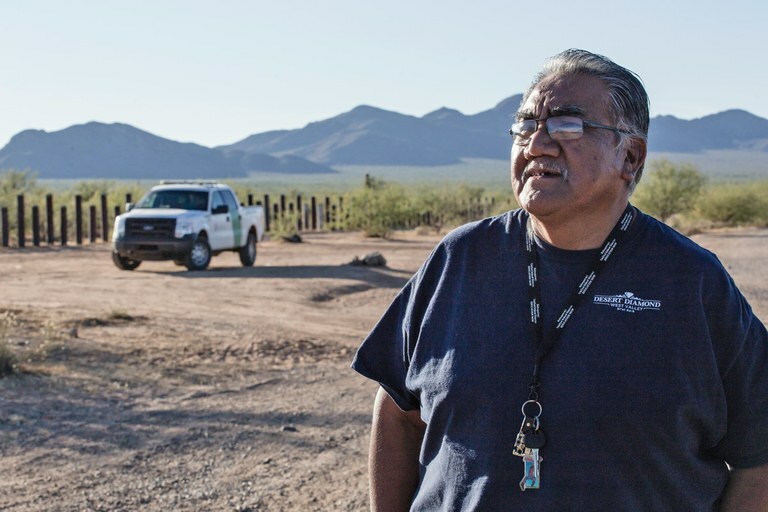 Like many in his generation, he appreciates the security that the U.S. Border Patrol and the fence offers, but he is upset by the increasingly clear separation between O’odham people, based on which side of the border they live on. Wilson, whose tribal affiliation makes him a U.S. citizen, was born on the Mexican side of the border but grew up crossing it freely between home and school. O’odham then not only identified as O’odham first but also lived, functioned and socialized as O’odham first. The distinction of American or Mexican was secondary. But in the 1990s, when Mexican drug cartels began to infiltrate the reservation, violence exploded. Today, tribal officials still consider drug activity to be at a crisis level and have been actively — and fairly successfully — working to control it. According to the Tohono O’odham Department of Public Safety, migrant apprehensions on the reservation dropped by 84 percent from 2003 to 2016, thanks in large part to the tribe’s contribution of resources and efforts. During that time, the Tohono O’odham Police Department and U.S. Border Patrol worked together to seize a yearly average of about 300,000 pounds of illegal drugs on the reservation. Integrated Fixed Towers, otherwise known as IFTs, are now the focus of conversation about the border for the Tohono O’odham. Described as a “virtual wall,” IFTs are solar-powered surveillance systems equipped with infrared and video technology to detect movement. According to U.S. Customs and Border Protection, the towers use surveillance cameras to help Border Patrol agents detect and respond more quickly to border incursions. Right now, there are 52 IFTs up and running in southern Arizona. None, however, are on the Tohono O’odham Reservation. Both the tribal chairman and vice chairman support IFTs, as do many other leaders and citizens, but the nation’s young activists are staunchly opposed. Tohono O’odham community organizer Amy Juan opposes Border Patrol surveillance. The day I visited the border, where the road from Sells ended, I stood near the fence with Art Wilson, listening to stories from his childhood. As we talked, a Border Patrol agent approached us and warned us, respectfully, that without permission from the Tohono O’odham government we would have to leave the area and take our cameras with us. Wilson showed the agent his tribal I.D. and the issue was settled, but it seemed odd to me that a Tohono O’odham tribal member in his own homeland would need to carry identification for American border agents. Wilson appeared unbothered. But as we drove north along the rough, dirt road, I asked him what he would do to solve the problem. Chelsey Luger is a freelance journalist and a member of the Turtle Mountain Band of Chippewa.